As the flagship wrestling release, 2016 Topps WWE Wrestling takes a detailed look at the sport from several vantage points. Each hobby box includes two hits. The 100-card base set features a variety of Superstars, Divas and Legends as well as the rookie cards for Becky Lynch, Mandy and Tyler Breeze. The main set includes WWE Tag Team Championship Bronze (1:2), Divas Championship Silver (1:24 - Hobby), Intercontinental Championship Gold (#/10) and WWE World Heavyweight Championship Red (1/1) parallels. There are also 33 cards for NXT subjects and 36 Superstars Perspectives that offer an Authority and Anti-Authority take for each. Among the signed cards, Base Autographs cover the top options with sticker signatures and several parallels, including hobby-exclusive Silver and Printing Plates (1/1). There are also Triple Autographs. A common feature in WWE sets, Diva Kiss and Autographed Diva Kiss cards showcase key Divas from the past, present and future with an authentic kiss. Featuring a variety hits, including the first-ever NXT Mat Relics and Perspectives Medallions, collectors can find both relics and autographs. On the memorabilia and commemorative relic side there are Shirt Relics (#/299) and Mat Relics (#/199), with mat options from both the NXT TakeOver: Brooklyn and SummerSlam 2015. There are also parallels and Printing Plates (1/1). 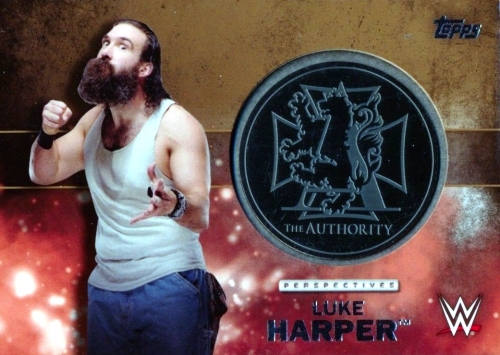 Building on the Superstars Perspectives subset in 2016 Topps WWE Wrestling, Perspectives Medallions (#/299) feature a manufactured medallion relic. Closing things out, The Rock Tribute (1:6 packs) features ten more cards for the insert that honors the wrestling persona of Dwayne Johnson. Bret Hart, Brock Lesnar and Triple H are also celebrated with Tribute sets. 8 cards. Serial Numbered #/11. 11 This is Your Life! PARALLEL CARDS: Gold #/10, Autograph #/25, Autograph Printing Plates 1/1. 24 cards. Serial Numbered #/299. PARALLEL CARDS: Bronze #/50, Silver #/25, Gold #/10. 32 cards. Serial Numbered #/299. 10 cards (1:6 packs). Continuation insert. Good: All hits numbered, moderate price tag. Bad: No guaranteed autographs per box, not much design variety in box. The Bottom Line: A simple release that guarantees two hits in every box for $50-60, 2016 Topps WWE has the makings of a budget hit. However, for a flagship set, there is really not much happening and the intrigue takes a dip considering the two hits can be only medallions or relics. 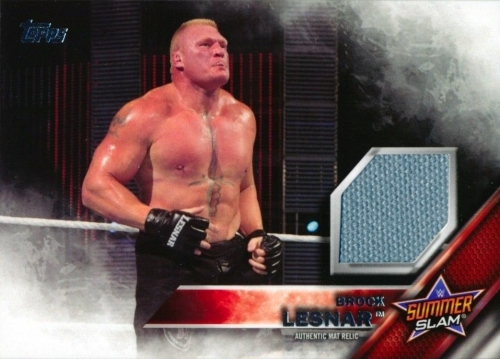 From a design perspective, 2016 Topps WWE exclusively borrows the 2016 flagship baseball design. So, if you like it for MLB, there is a good chance you will like it for WWE. I personally feel the full-bleed design and smokey corners work better here given the theatrics of the wrestling world and lively outfits. While sticker autographs are not the preferred option, the design incorporates the stickers well and I also appreciate the known print runs for the autographs and all the other hits. Beyond a ton of base and a few parallels, there is really not much else to speak of in the average box. Tributes are a regular thing each year — The Rock gets the call in 2016 products — and Perspectives is the only other hobby insert. NXT is technically an insert but really more of an extension of the base set (minus the parallels) and should just be numbered as such. Former greats, current stars and rising names are all covered in 2016 Topps WWE so collectors can get a good mix. 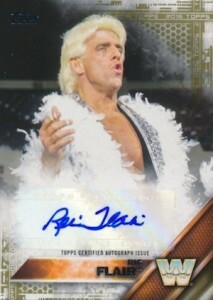 This includes several NXT debuts and some WWE rookie cards. While it’s not the deepest autograph checklist, there are still some pretty big signers to hit. One larger issue is that many products now offer generic box guarantees on hits and this is one of those products. Sure, if you hit two autographs, there is decent chance you will pull a notable name. But medallions and relics are not quite as satisfying as the sole box hits and that is also a possibility. Because of the cheaper price, value has more room to work based on the two hits per box. It really boils down to what form those hits take. That ultimately ups the risk and lowers the value. Still, it’s harder to complain about two either/or hits when boxes are already around $55 and likely to dip a bit more down the road. I largely enjoy the flagship baseball design and I think it worked even better here. This increased the fun. In lower-end sets like this, I look more to what the inserts bring to the table. This is where the set was little disappointing. However, two autographs, including a rookie star and HOF member, in the box I opened made for a very exciting experience. While they are not all like this, it made it a little easier to overlook the shortcomings of the set as it pertains to fun. I really enjoy this one. 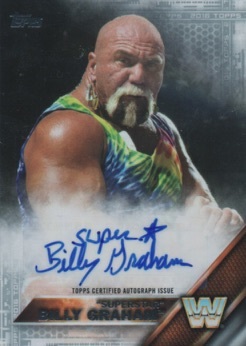 I like 2016 Topps Baseball a whole lot and seeing my favorite WWE stars with the same design is really cool. What is that Bret Hart Tribute (part 2) set? I don’t recall a set that it could be continued from. I give it low due to the lack of insert sets and the fact that they keep usng NXT cards as an I sert set..I should rate lower cause of those stupid medallion cards, they should NOT count as a hit.. Also, I just pulled a Naomi shirt relic and, unless it’s an error,this card is numbered to 209, not 299.. SP, maybe? Its not a parallel cause those start at 50 and go down.. Anyone know why the active roster checklist is so small? No Ambrose, Rollins, Reigns, HHH, Lesnar, Wyatt Family, probably more but those just jumped out. 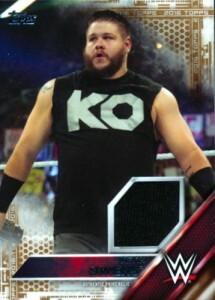 I also don’t like how the Kevin Owens (and others) are not rookies in this set. I know their rookies were in last years Heritage set, but it’s still their first card in the main set, seems like it should be a rookie too. As with every year, this product provides a good value however, the addition of medallion cards water down the value of the hits. I am in agreeance with the previous reviews that this should not count as a hit. I am glad they this year has a “fresh” design and not recycled from other products. As a entry level product i would expect that the base set be larger as 50% of the superstars in it are retired legends. 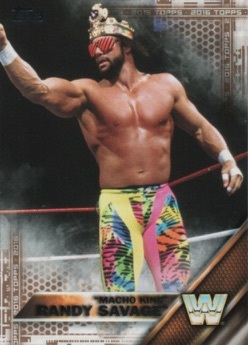 I would suggest that Topps relook at the way the make the base set to feature more current roster superstars; most of the intended audience (kids) do not know most of the classic “attitude era” & older) superstars.